Each on a later tapering rectangular marble pedestal; one signed twice with initials on the reverse 'I.R'. F. Souchal, French Sculptors of the 17th and 18th Centuries - the Reign of Louis XIV, III, Oxford, 1987, p. 212. F. Souchal, French Sculptors of the 17th and 18th Centuries - the Reign of Louis XIV, IV (supplement A-Z), London, 1993, pp. 180-183. The sculptor Jean Raon (1630-1707) came from a family of stone masons in Paris. He was in Rome for three years from 1666 on a pension from the king, and on his return to Paris was employed by the Bâtiments du Roi, where he spent the rest of his career (Souchal, 1987, op. cit., p. 212). 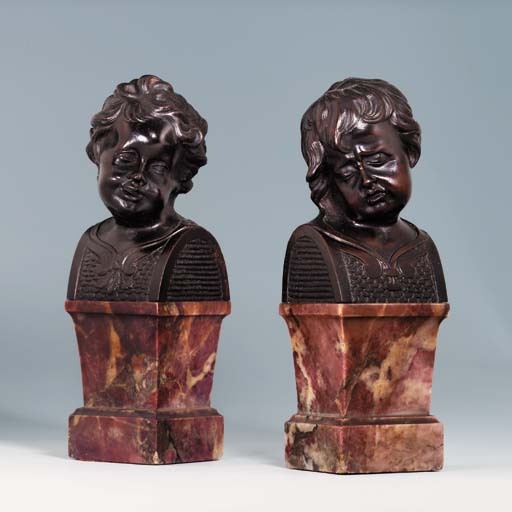 The present pair of bronze busts are closely similar to a number of marble busts of the muses in the Château de Thoiry (Souchal, 1993, op. cit., nos. 47-52). The facial type, as well as the distinctive truncation of the shoulders evident here, are both typical of the work of Raon. The initials on the reverse of one of these busts would appear to confirm the attribution.